Avast Antivirus uses a database of known Virus definitions to identify malware and other threats on your PC, which is why it is important to ensure the Virus definitions are regularly updated. The application refers to the user interface and all components in Avast Antivirus. Updates to the application provide bug fixes and general improvements. By default, Avast Antivirus is set to update the Virus definitions and application automatically whenever a new version is available. We strongly recommend you keep automatic updates enabled. 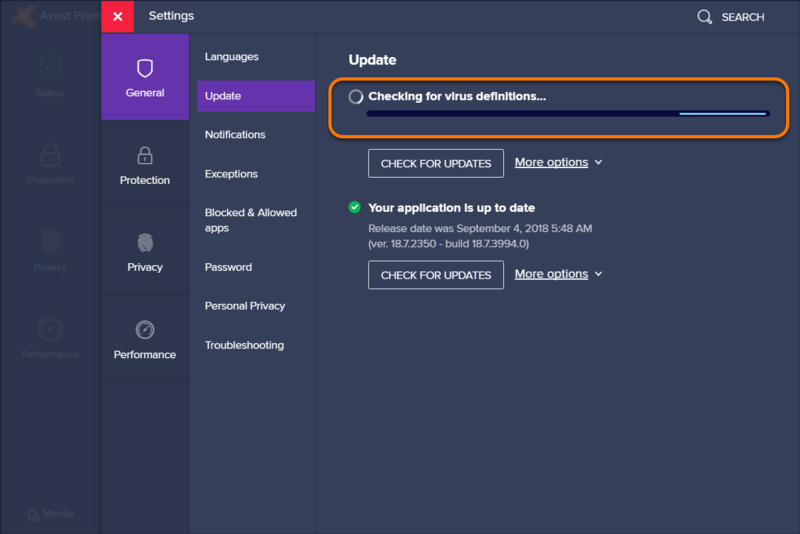 Right-click the Avast icon and select Update ▸ Engine and virus definitions. 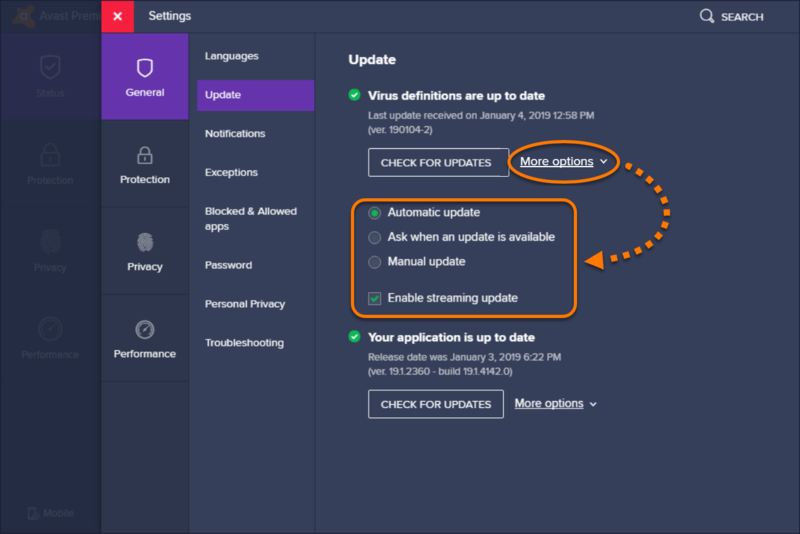 If Avast doesn't begin checking for updates automatically, click Check For Updates. 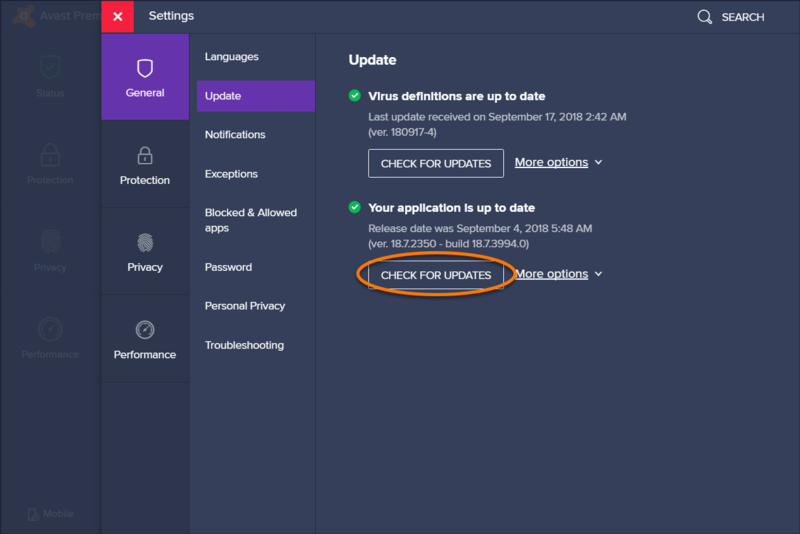 Wait while Avast checks for virus definition updates. When the update is complete, you will see that Virus definitions are up to date. If you are asked to restart your PC, click Restart Now to reboot immediately. The application update also includes an update of Engine and Virus definitions. 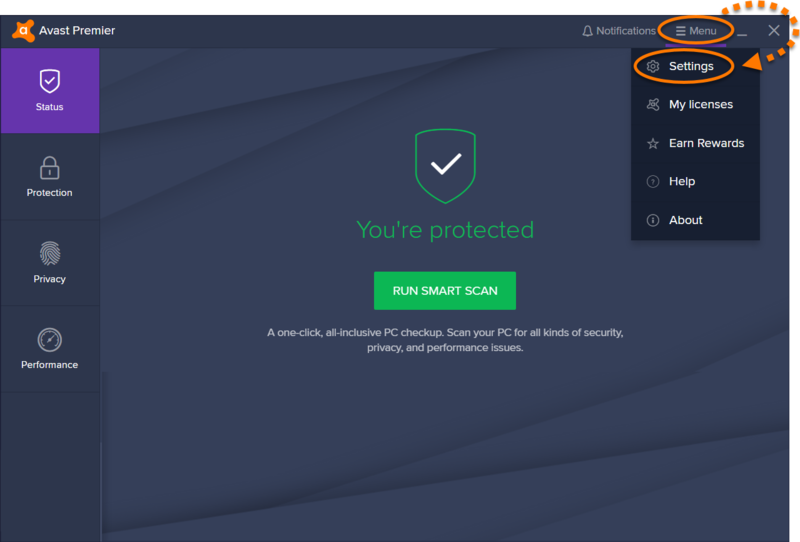 Right-click the Avast icon and select Update ▸ Program. 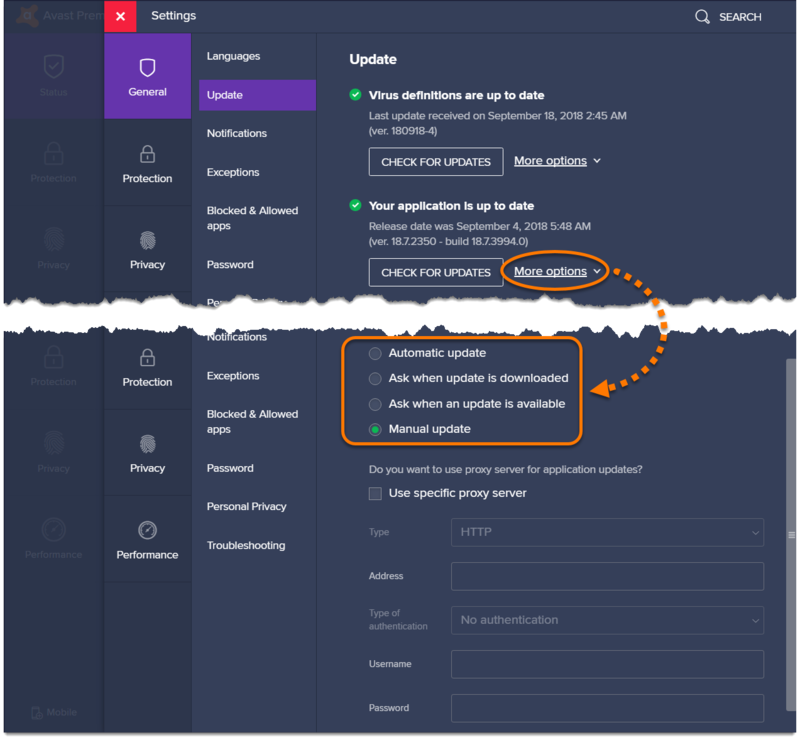 When the update is complete, you will see that Your application is up to date. Select General from the left panel, and click Update. Automatic update (enabled by default): updates are downloaded and installed automatically on a regular basis. No actions are required from you. Ask when an update is available: notifies you when an update is available. Your confirmation is required to complete the update. Manual update (not recommended): updates are not automatically installed and you are not notified when a new update is available. Enable streaming updates (enabled by default): downloads micro-updates continuously as new malware is discovered. Automatic update (enabled by default): updates are regularly downloaded and installed. No actions are required from you. Ask when update is downloaded: notifies you when updates are downloaded. Your confirmation is required to complete the update. Ask when an update is available: notifies you when updates are available (before downloading). To receive the update, you need to start the download and installation process manually. The Proxy Settings section is for users who connect to the internet through a proxy server. 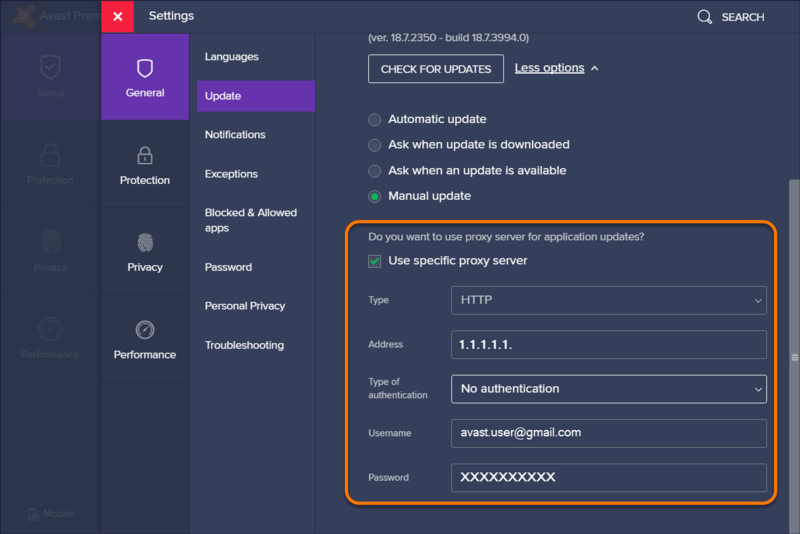 This section allows you to adjust your proxy settings to avoid issues with downloading Virus definitions and application updates. If you connect directly to the internet, you can ignore this section as the Use specific proxy server option is disabled by default. Tick the box next to Use specific proxy server and type your proxy details into the relevant text box. Type: select HTTP or SOCKS4. Address: type the address of your proxy server. Authentication type: if the proxy server requires authentication, specify the type and enter the Username and Password. If you do not know your proxy details, contact your network administrator or your internet service provider (ISP).